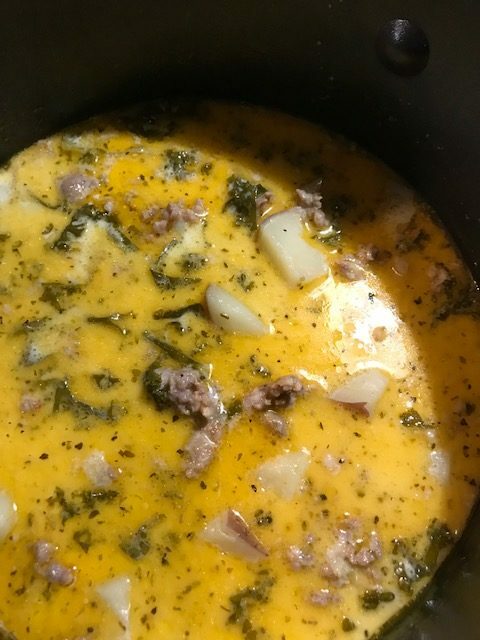 In under 25 minutes you’ll have this Instant Pot Copycat Olive Garden Zuppa Toscana recipe on your table! This is a fan favorite! Set your post to the saute feature. Add in olive oil, onions and sausage and cook until browned. Add in garlic and let cook for 2-3 minutes until softened. Add potatoes, chicken broth and kale. Place lid and make sure your seal is set to sealed. Place pot to manual high for 10 minutes. Allow to naturally release until it has finished and then do a quick release. Add in heavy cream and stir until combined. 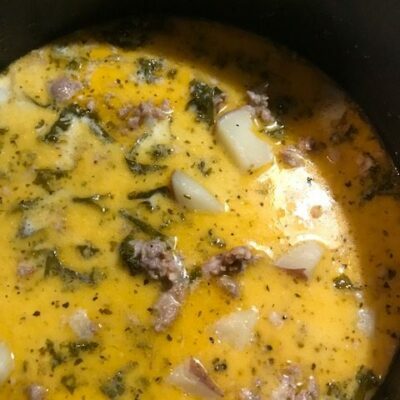 What should I serve with Zuppa Toscana? How many calories are in Olive Garden’s Zuppa Toscana? This version is 492 calories per serving, if serving 6 people. You're now able to enjoy this reader favorite Instant Pot Copycat Olive Garden Zuppa Toscana recipe in just minutes! Add potatoes, chicken broth and place kale on top.